Journalist Nick Davies says we don’t have press freedom in Britain. The British press used to be free but it it’s not now – it’s in chains. Some of the chains are financial. The internet is taking away the readers and advertisers, so it’s difficult for news organizations to find the money they need. So they get money for including information from governments and businesses. Other chains are political. There is a lot of secrecy in the public sector. Civil servants, police officers, care workers and others are not allowed to talk to reporters. Journalists have to get their information from the press officers. But the tightest chains are legal. We have the Official Secrets Act so whistleblowers (people who give information to the public) can be prosecuted. David Shayler, for example, worked for the internal security service, MI5, and told a journalist about all the mistakes M15 made in its operations against IRA terrorists. He was chased across Europe, jailed in Paris, brought back to London and jailed again. This sends a clear message that no-one should be a whistleblower. British criminal law can be strict, but the civil law can be even worse. Julian Assange and I set up a group of newspapers to publish the secrets given to Wikileaks by Chelsea Manning. And we immediately decided to involve The New York Times to escape from the British courts, because of the difference in law between the UK and the US. When people from British intelligence said they were going to come to the Guardian’s office to physically destroy laptops with some of the information given by Edward Snowden, the editor, Alan Rusbridger, gave a copy of the material to The New York Times. Britain is famous all over the world for its libel laws. They are too expensive for most normal people to use. But they are very useful for the rich and powerful to stop the media saying things they don’t like. So it is not enough for British reporters to publish the truth: they also have to be able to prove it in court, and this is not possible for a lot of information. If British reporters make a mistake, they can be punished with hundreds of thousands of pounds of legal costs. All whistleblowers take risks. In Britain, those risks are very clear. Some whistleblowers are successful because they see their role as political. They become the centre of a political campaign that can sometimes persuade the state to be more open. Nick Davies is a journalist and documentary maker. His most recent book, Hack Attack: How the Truth Caught Up with Rupert Murdoch, was published in August 2014. 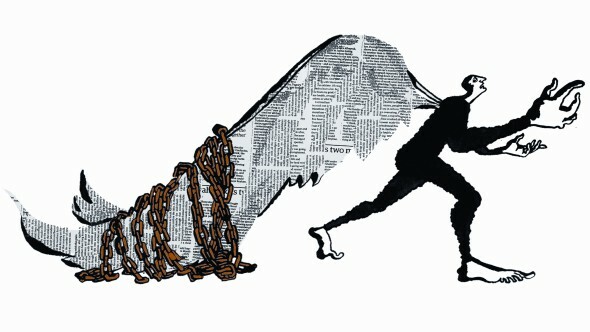 NOW READ THE ORIGINAL: http://newint.org/features/2015/01/01/press-freedom-myths/ (This article has been simplified so the words, text structure and quotes may have been changed). This page was last edited on 8 February 2015, at 16:28. This page has been accessed 1,272 times.